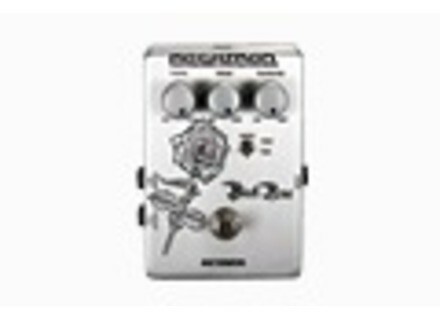 Black Rose Octaver, Octaver/Harmonizer/Whammy from Rocktron in the Boutique series. Part of the Rocktron Boutique Series of stomp boxes, the Black Rose comes in a rugged metal chassis with retro-custom designed, laser-etched artwork. The Black Rose Octaver is a true bypass pedal: when turned of it is out of the signal path. Controls for the Black Rose Octaver include: Thorns, Merge, and Fragrance. Thorns determines the intensity and tracking (-12 steps) of the Octave below Effect. Merge controls the Mix between the original input and the Octave effect. Fragrance controls the overall tonal color of the effect. A special switch called Roots allows you to go from Thick (heavy crunch) to Thin (smoother). The Black Rose has two outputs. The first is called Output Wet, which contains the mixed Octave effect. Output Dry provides the feed through of the original Input source with no effect. The Black Rose Octaver has an LED indicator for the footswitch effect on/off. The footswitch on the Black Rose Octaver controls on/off status (indicated by the LED). This stomp box runs on a 9V alkaline battery and may also be powered by Rocktron’s DC OnTap Universal Power Adaptor. For more information check out www.rocktron.com. Flynn Amps Treble Booster : Classic OC44 Flynn Amps have released their newly updated Classic OC44 Booster. FEA Labs Opti-FET FEA Labs announced the latest product in their pedal lineup, the Opti-FET Compressor. Clayton Custom Guitar Picks Clayton Custom Guitar Picks has added more options to their custom guitar pick designer at www.claytoncustom.com.